One of the most valuable tools that we have as market participants is in taking the sum of the parts to help come up with a final conclusion. While we all talk about what the Dow did yesterday or what it’s done year-to-date, it is easy to forget that there are 30 companies driving this popular U.S. stock market benchmark. By going through each of these 30 stocks, we can get a better feel for the market itself rather than just analyzing the performance of the index. To me, it’s the combination of the two that seems to be the best approach. Last week all of the energy sectors that we follow simultaneously hit our downside targets. 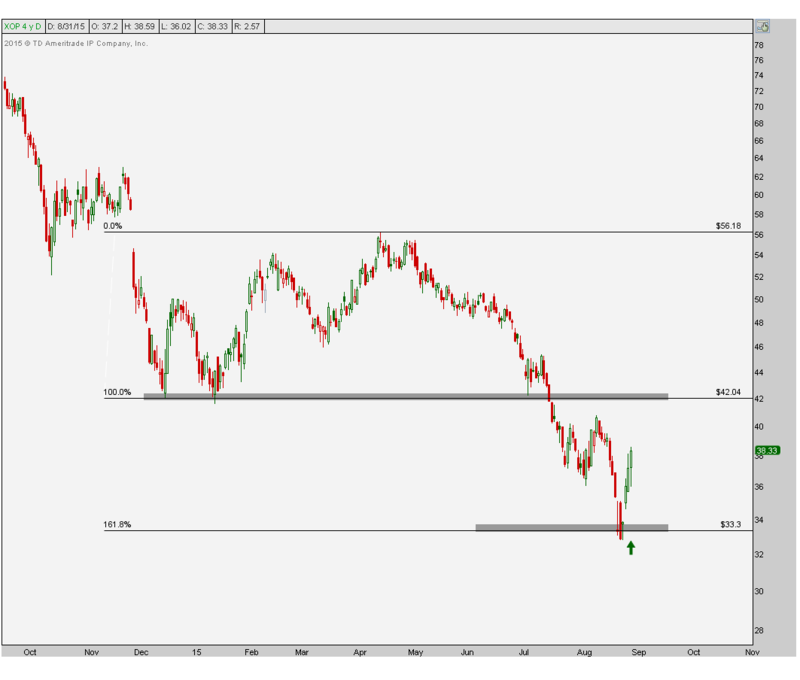 Subscribers to our research had been eyeing these downside targets for a long time and at this point we no longer see a reason to be short Energy, particularly on a relative basis. The sector ETFs that I am referring to are the S&P Energy Sector $XLE, Oil Services $OIH and Oil & Gas Exploration & Production $XOP. 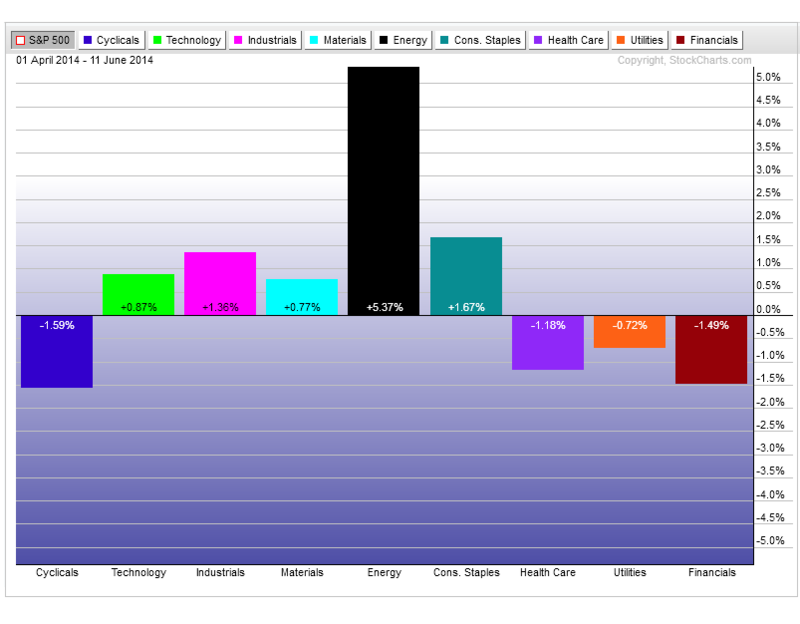 Going forward, I believe these sectors will outperform the overall U.S. stock market. 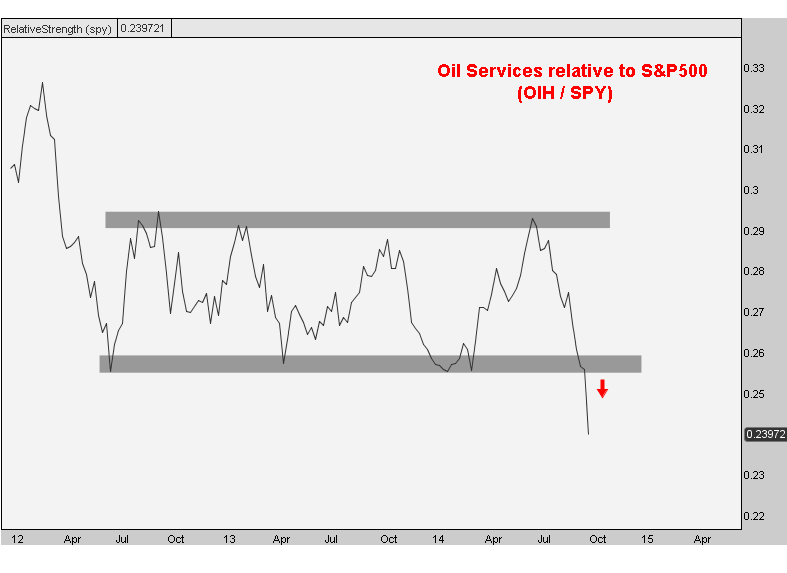 Next we are looking at the Oil Services names $OIH. These are the Schlumbergers, Halliburtons and Baker Hughes of the world. 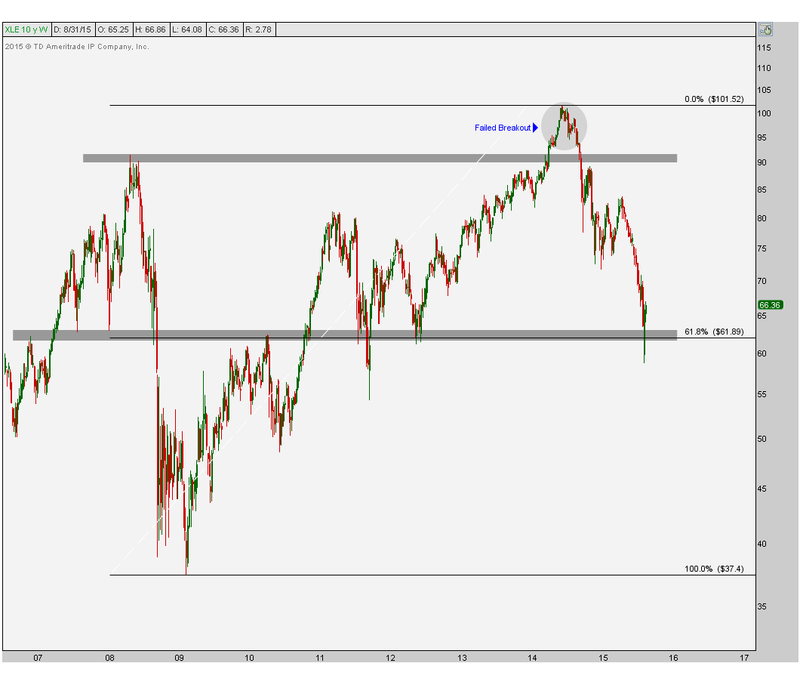 Once prices broke the early 2015 lows, our next downside target was near $26, which was based on the 161.8% Fibonacci extension of the counter-trend rally in March & April. This target was hit last week and prices ripped from there. I think this is an interesting theme. It’s a combination of all of our downside objectives being achieved while momentum is showing bullish divergences on all timeframes in all 3 sectors. I think this can be the catalyst to get these going on a relative basis after struggling for so long. As far as the market itself is concerned, I’m still not a fan (See Here). I haven’t been (See Here) and things have gotten worse. There is just way too much overhead supply up here for me to get excited. So as far as U.S. Equities go, it’s looking for the outperformers to buy against market shorts that I’m mostly concerned with. From a risk management perspective, these recent lows are big levels, particularly on a relative basis. 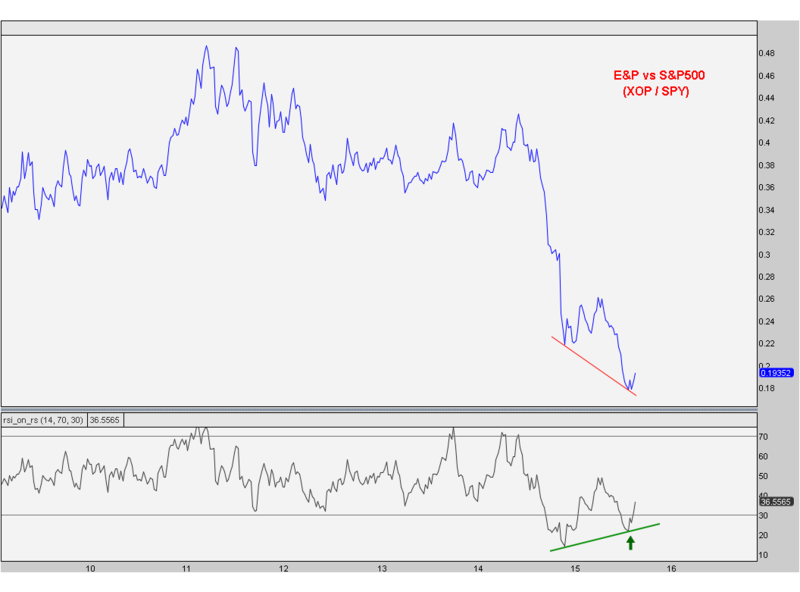 If the recent relative lows are taken out and these momentum divergences fail, then all bets are off. This makes things easy on us because the levels are so well-defined. I believe this is the lower probability outcome, but we always want to keep an open mind. The weight-of-the-evidence, however, suggests that energy is where we want to be relative to the overall market going forward. 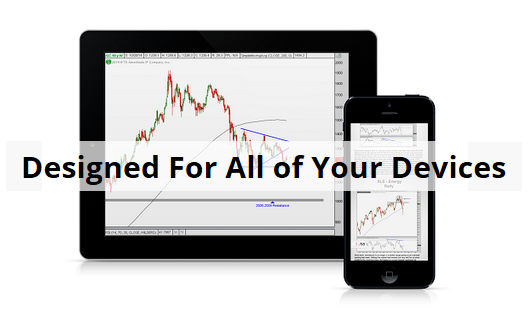 Sign up here to receive updates on all of these charts every week. 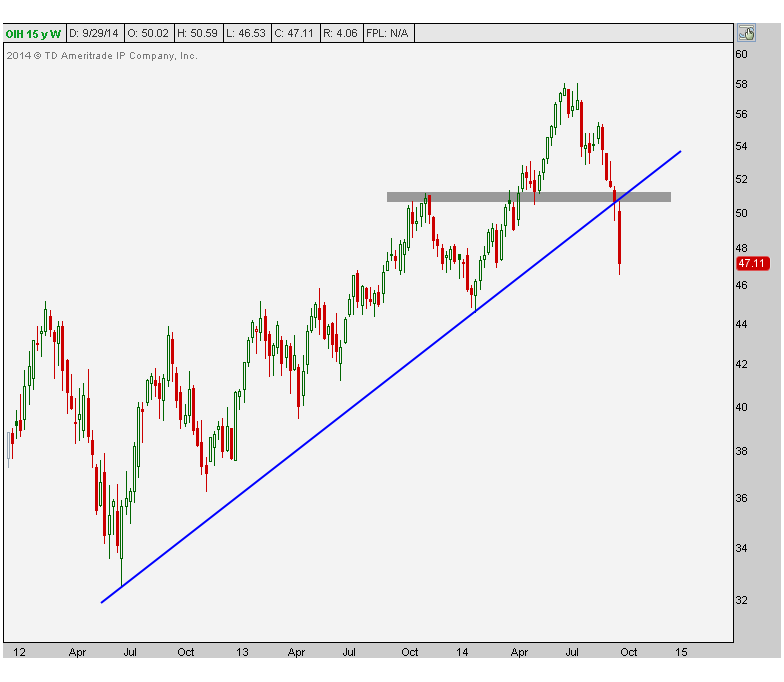 What’s Wrong With Energy Stocks? There has been some heavy selling in the energy names over the past month. I do a weekly review of all 30 Dow components using multiple timeframes, and it’s hard to find 2 worse names in the group than Exxon and Chevron. Both of them are making new lows on a relative basis and continue to disappoint in price itself also. These guys are obviously the biggest names in Energy, so it shouldn’t be surprising to see the Sector itself struggle. But what’s most interesting is that we are now back below the highs from 2008, which is a big problem. 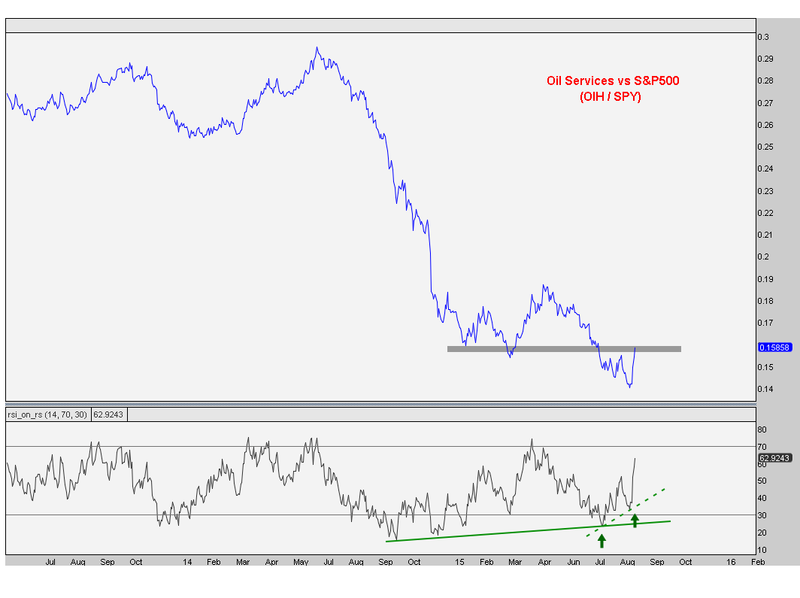 Here are the Oil Services themselves where we can see that last week prices not only broke the uptrend line from the 2012 lows, but also the horizontal support from prior resistance last year. 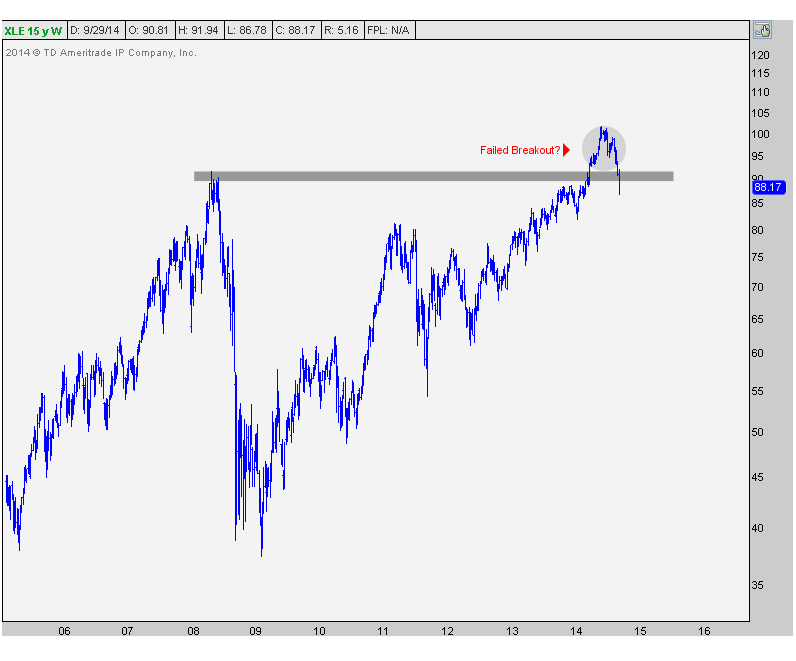 These are very bearish developments, particularly as it breaks down relative to the rest of the market as seen in the chart above. This is not somewhere we want to be. I would continue to fade any strength in energy. These are not characteristics of a bull market and suggest selling pressure in the near future is likely to stay. I’d take any rallies as an opportunity to either get out or initiate shorts. From a risk management standpoint, the support/resistance levels shown above are pretty clear. But I think bullish developments from this group are very much the lower probability outcome. We continue to see the late cycle sectors outperforming the the early cycle guys. 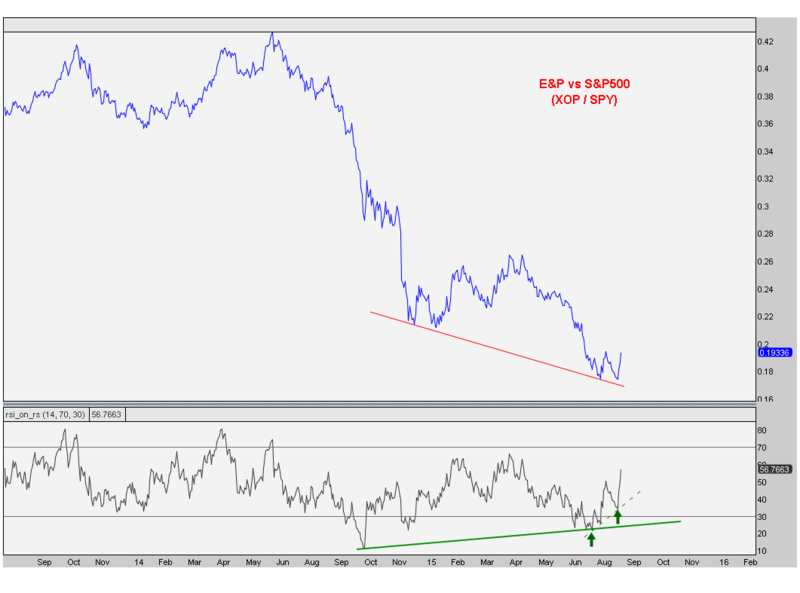 Two months ago I pointed to the relative strength that we should start to see out of the Energy Space due to the price pattern that had been developing in the Energy/S&P500 ratio. So far this is working out very well, but I believe this is still only the beginning. 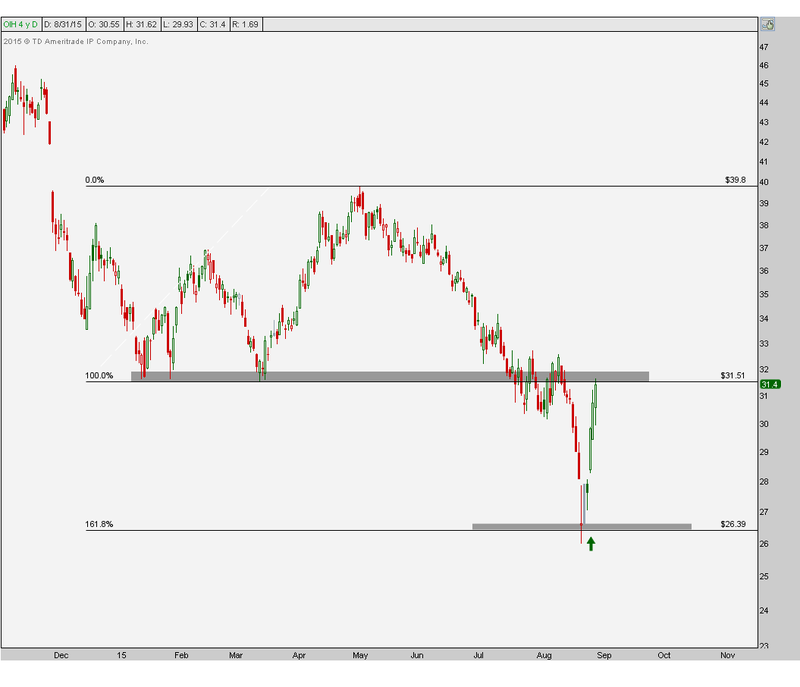 The catalyst for this breakout is without a doubt that failed breakdown early in the year. From false moves come really fast ones in the opposite direction. Throughout the second quarter, we’ve started to see that. But when a pattern like this is completed, the resolution tends to create a trend that can last longer than most expect. I think there is still 20% upside here and that only gets us to the 2011 highs. At that point we can reevaluate, with the understanding that we can definitely go a lot higher. 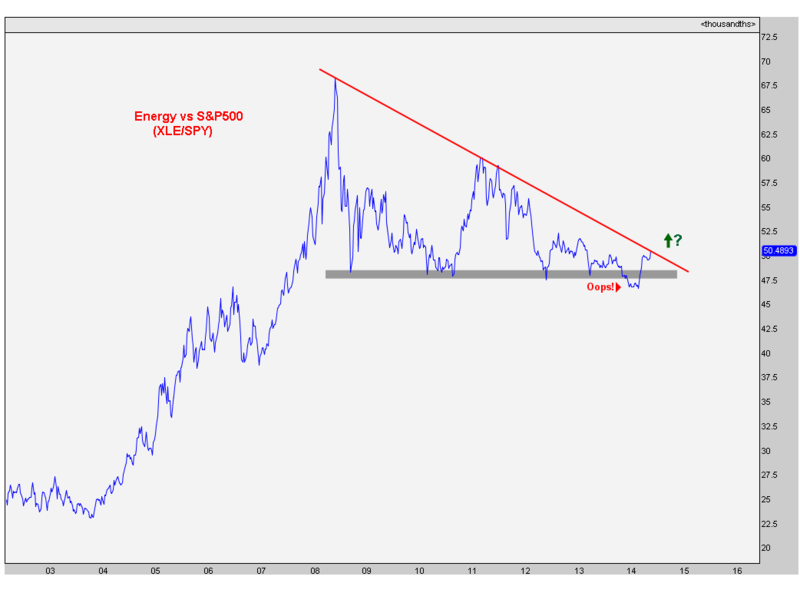 A breakout above what most chart watchers would consider to be a descending triangle would be extremely bullish for this ratio. This has broader market implications as well. Remember that the market capitalization of some of these Energy names ($XOM $CVX $COP $SLB $PSX) are massive and can therefore hide some of the weakness in the other sectors. 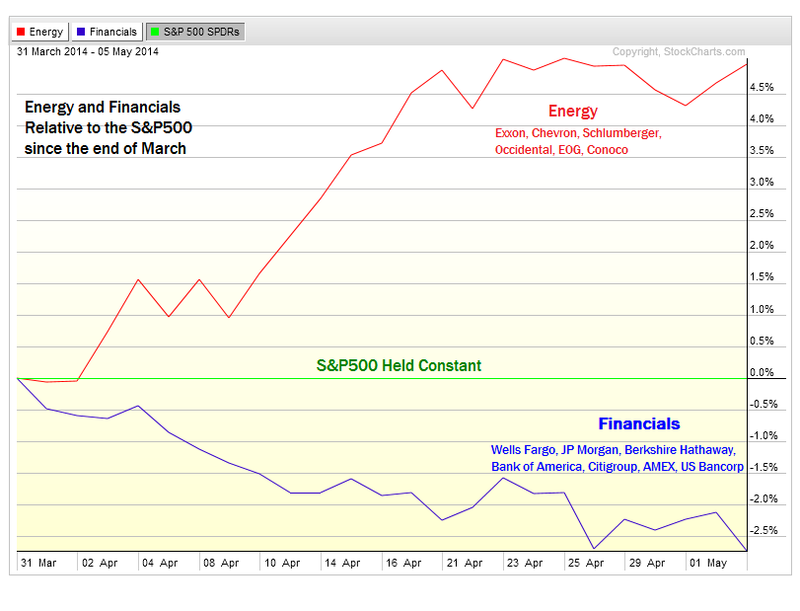 So while some stocks might get crushed, the Energy names can still hold the market up a bit. This is text book late cycle behavior and suggests that we are likely in the latter stages of this 5+ year bull market for US Stocks. I continue to like the energy space, but particularly on a relative basis. This is one of the more interesting developments we’ve seen throughout the second quarter, but I don’t see it getting many headlines. We like that. When they really start talking about this, we’ll probably look to fade it. But I don’t think we’re anywhere near that point yet. REGISTER HERE for more information on how to access updates on these sector charts on multiple time frames. A big theme that we’ve been focusing on lately is the rotation into Energy stocks and out of some of the early cycle sectors. 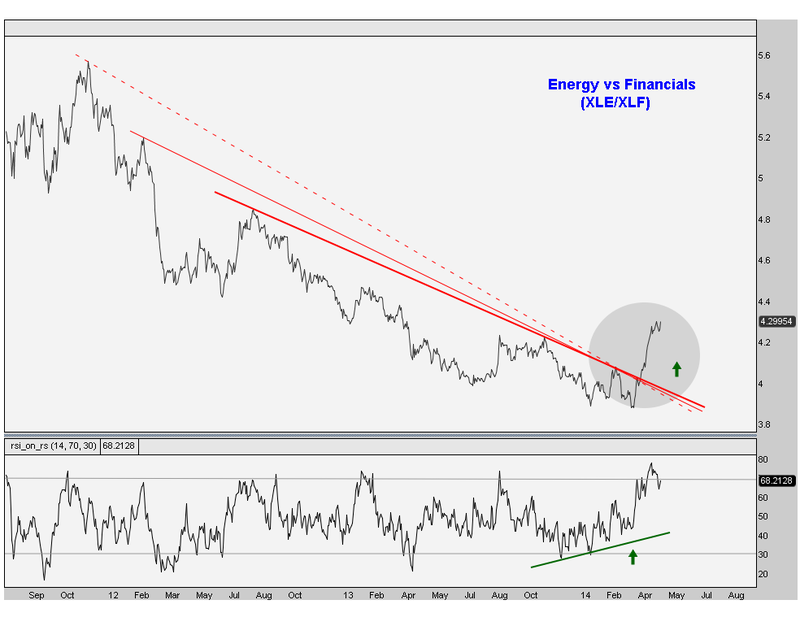 Today I want to specifically point to last month’s breakout in Energy vs the Financial sector ($XLE vs $XLF). After several years of underperformance, it’s now the Energy names leading the way and making new highs while each of the Financial components break down one by one. They’re dropping like flies these days. Last week, Bank of America gapped lower on Monday morning after news of some accounting error or something. The media likes to blame that for the sell-off, but technicians know this stock had already been selling off well before that announcement (see here). This week we come into the office and it’s JP Morgan who’s gapping lower to start the week, closing Monday near 6-month lows. Who knows what the excuse is for this one, maybe the weather or Ukraine or something. Regardless of the “reasons”, all of these banks, one by one are getting crushed. 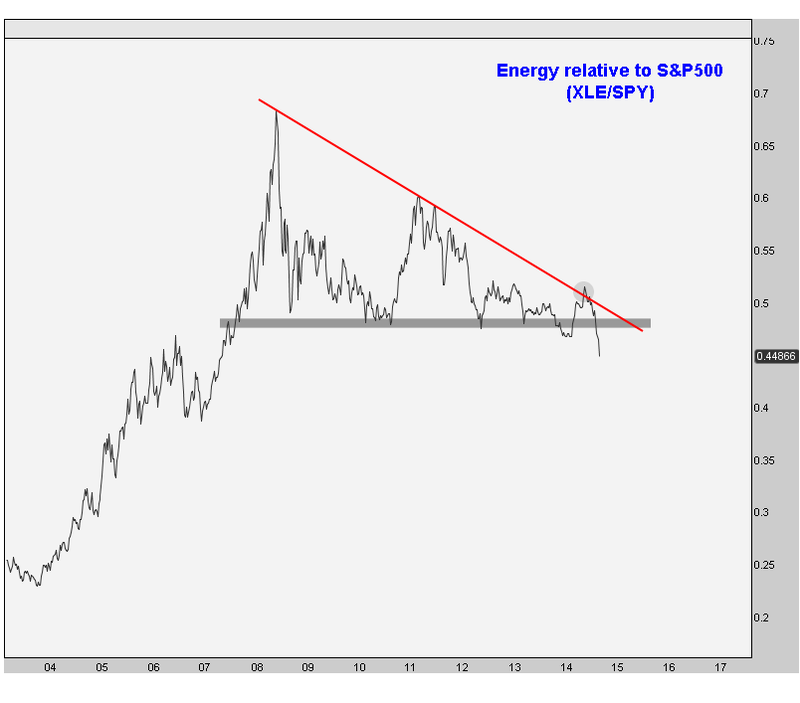 I don’t care how you draw your trendlines; Energy is breaking out above all of them. Notice how this was all happening as momentum had been diverging positively all year long. Energy is by far and away the best sector over the past 5 weeks up almost 6% while financials are by far the worst during the same period. I think based on this breakout in the first chart above, this trend is likely to stay. There are a few things we can gather from this action. #1 and most obvious is that Energy is clearly where we want to be, especially on a relative basis. 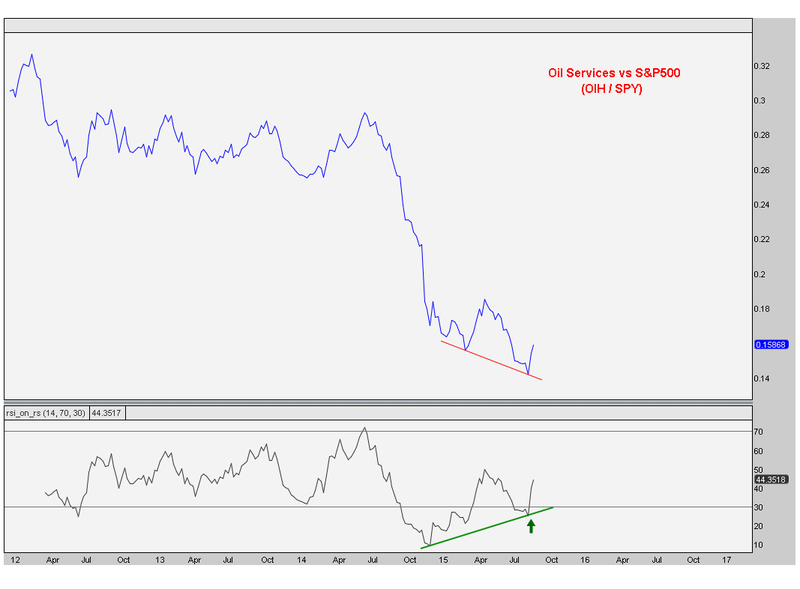 Financials on the other hand are a sector we want to be fading on any strength. #2 is that money is flowing heavily into late cycle sectors and out of the early cycle names, which is overall bearish for stocks as an asset class. And finally #3 is the answer to why the S&P500 is holding up better than the other US stock market averages. The market capitalizations for these Energy names are some of the biggest that we have (think Exxon, Chevron, etc). This rotation has helped the averages avoid this whole gravity problem. 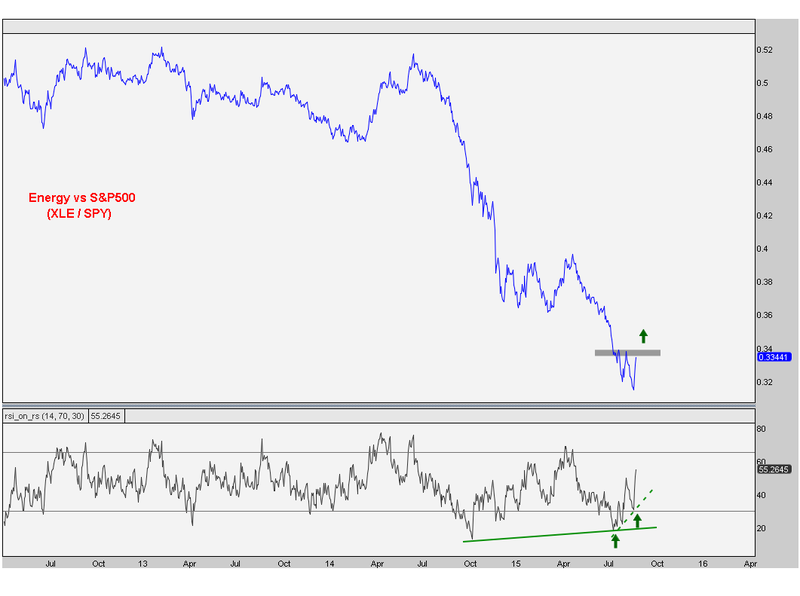 The last thing I wanted to mention is the lack of correlation between Crude Oil and Energy stocks. People are obsessed with comparing the two for some reason. The numbers, on the other hand (the truth), don’t add up. The 1-year correlation coefficient between $XLE and Crude Oil is the same as Bluto Blutarsky’s grade point average: Zero Point Zero. If you want to go back a little further, the 5-year correlation coefficient between the two is also zero point zero. So be careful who you listen to. Oil has done literally nothing for years now while Energy Stocks are at all-time highs. One thing has nothing to do with the other. We can definitely see this energy rally continue, but I just want to reiterate that the real action here is on a relative basis. 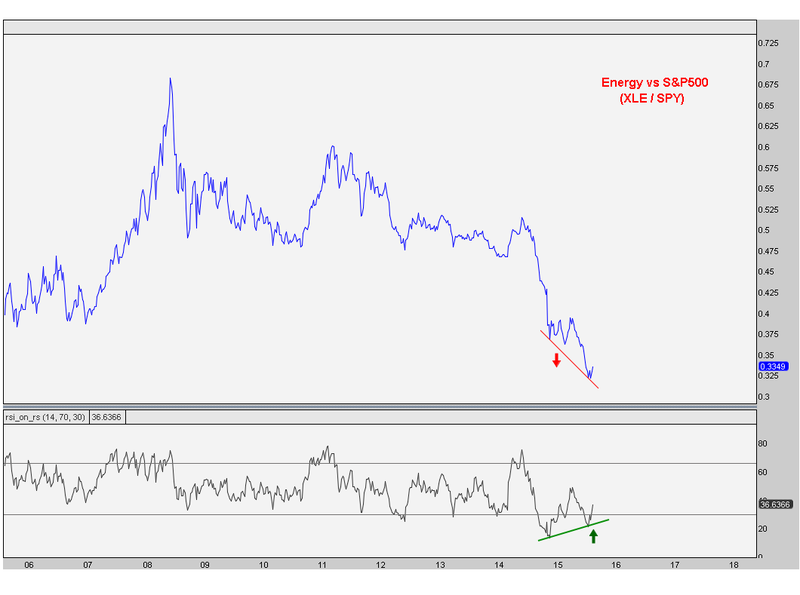 We’re not just seeing Energy breaking out compared to the S&P500, but most importantly vs the early cycle sectors. There’s a lot of information we can take from this. I hope this adds some value to what you’re already looking at. REGISTER HERE for more information on how to access these Energy charts along with the rest of the S&P sectors on a weekly basis. Earlier today I was down at the NYSE chatting with Jessica Menton from International Business Times. I sound like a broken record these days. I still like bonds, I still like commodities and the sector rotation continues to suggest that a more neutral or bearish stance is most appropriate right now for the US Stock Market. REGISTER HERE for more information on how to access these Energy charts along with the rest of the US Sectors on a weekly basis.